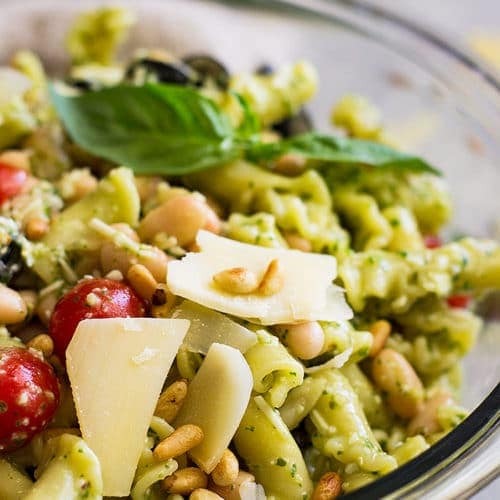 Italian Pesto Pasta Salad Recipe is an easy pasta salad that’s full of flavor! This cold pesto pasta salad is perfect for any night of the week or take it to your next summer BBQ. Well, it’s getting that time of year!! We are into the dog days of summer! And that means bring on all the summery foods! Cooking on the grill (or if you’re like me you cook on it year round), cool and refreshing drinks, and loads of fresh foods. Especially all the fresh fruit, I crave fruit in the summer months. 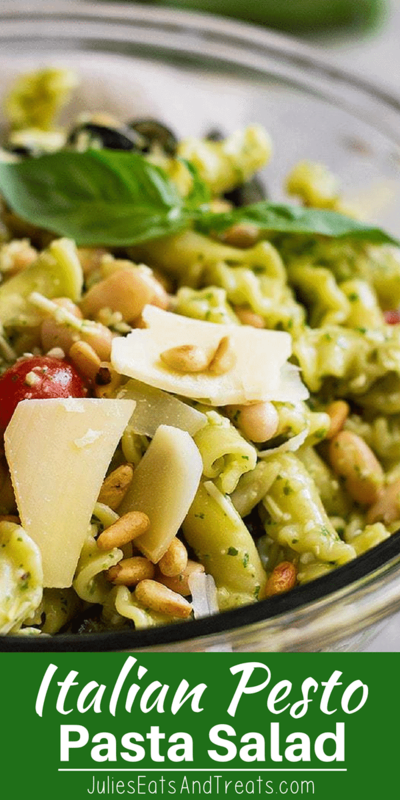 I also love this Italian Pesto Pasta Salad Recipe because it’s so full of flavor with white kidney beans, homemade pesto, pine nuts and Italian Salad Dressing! I’m always in need of a new side dish to go along with my grilled things and this Cold Pasta Salad is a good one!! There are so many ways to change it up that way you never get bored! 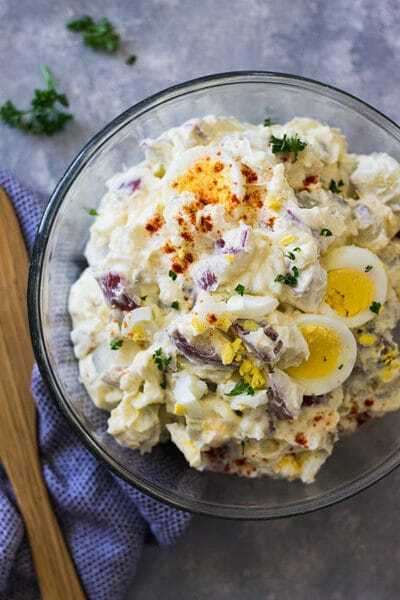 A few other great summery side dishes are: Greek Salad, Creamy Coleslaw, Old Fashioned Potato Salad, and Broccoli, Bacon, and Grape Salad. I STRONGLY suggest you spend the extra time to make your own pesto for this salad if you can. It makes all the difference. But I do realize the need for convenience too, trust me I have 8 kids! You can make this cold pasta salad 24 hours in advance and store in the refrigerator. Never made homemade pesto? It’s really quite easy to make – here’s a link that gives you great step-by-step directions! I was pleasantly surprised how well this pasta salad went over at the dinner table too!! My littles (that’s what I call my kids that are 3 and under) didn’t care for it but everyone else gave it a big thumbs up. Even the hubs liked it and he doesn’t eat anything that is green, lol! Can you cook pasta ahead of time? You bet! Cook the pasta to al dente and rinse it well in cold water. Adding a touch olive and toss to mix. The olive oil will keep the pasta from sticking together. Refrigerate until you’re ready to use. Additionally cold pasta will not absorb as much salad dressing. What other vegetables to add to cold pesto pasta salad? This pasta salad recipe can be changed up very easily. Add in your favorite rotisserie or grilled chicken, any type of short pasta works great or try cheese tortellini. 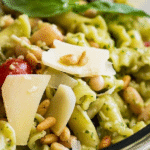 Make this pesto pasta salad recipe your own by changing out the white beans for garbanzo beans. Add fresh mozzarella balls, add cucumber or spinach. Pretty much anything that goes well in a salad will work here! Another reason why I like this cold pesto pasta salad or really any pasta salad is because they are pretty easy to make and so much flavor!! Choose your type of pasta you wish to use and cook according to the package directions. Drain and rinse the pasta in cold water (this will stop the cooking process and keep it from sticking together). 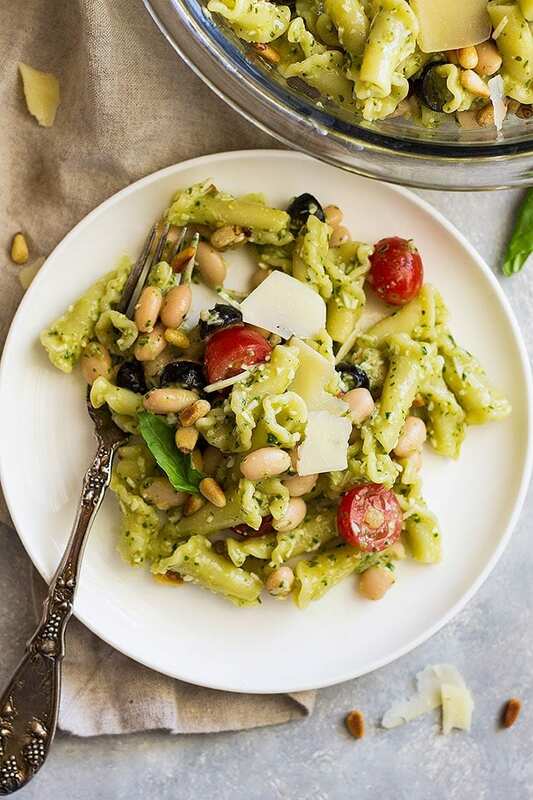 While your pasta is cooking stir together the pesto, Italian dressing, beans, tomatoes, olives, and cheese. Toss the noodles in the sauce and top with the pine nuts. If you aren’t planning on serving the pasta salad right away hold off on sprinkling with the pine nuts. 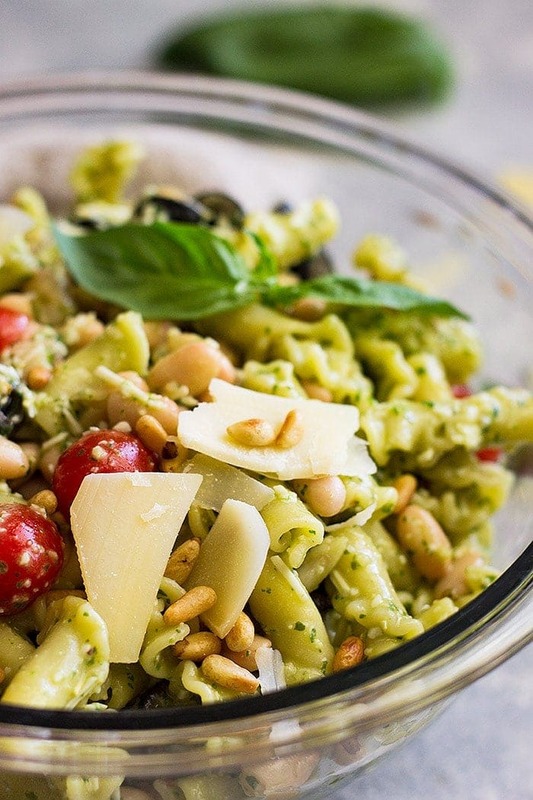 Well, I hope you all enjoy this summery Pesto Pasta Salad Recipe as much as we do! 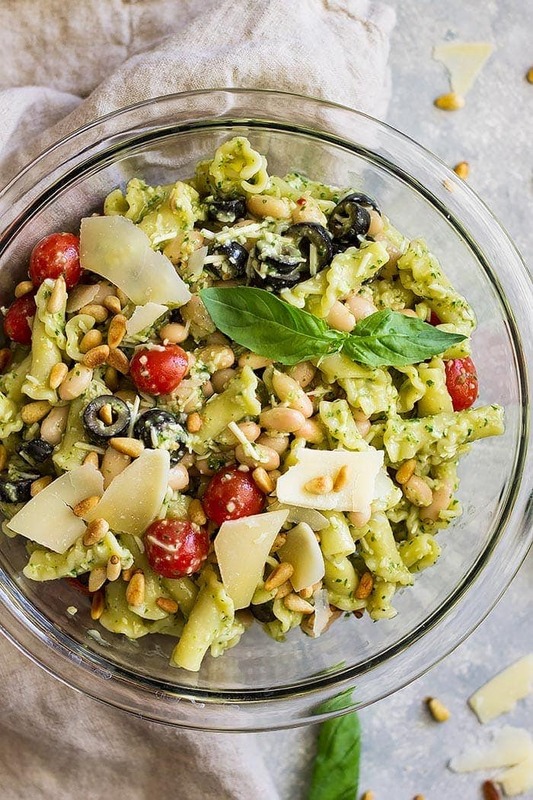 This Italian Pesto Pasta Salad Recipe is an easy pasta salad that's full of flavor! Cold pesto pasta salad is perfect for any night of the week or take it to your next summer BBQ. Cook pasta according to package directions. Drain and rinse in cold water. Meanwhile in a large bowl combine the pesto, Italian dressing, beans, tomatoes, olives, and cheese. Stir in pasta. Store in the refrigerator until ready to serve. Top with toasted pine nuts just before serving. 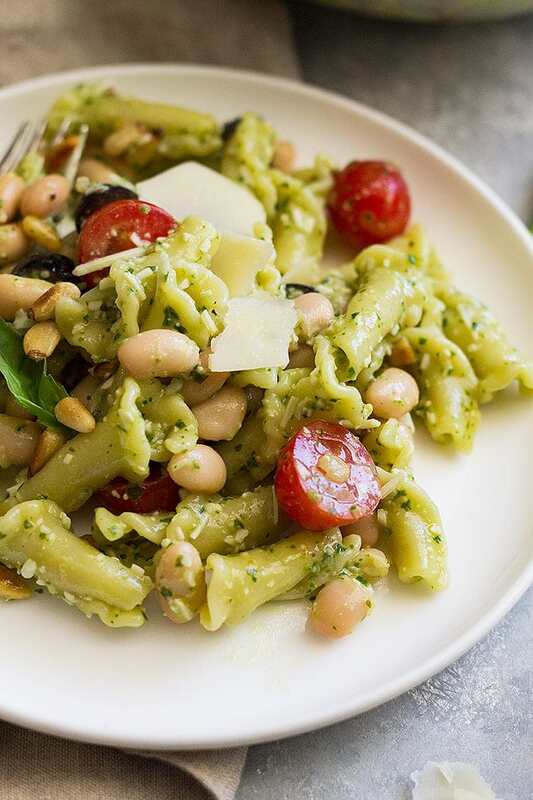 You can make this pesto pasta salad 24 hours in advance and store in the refrigerator. 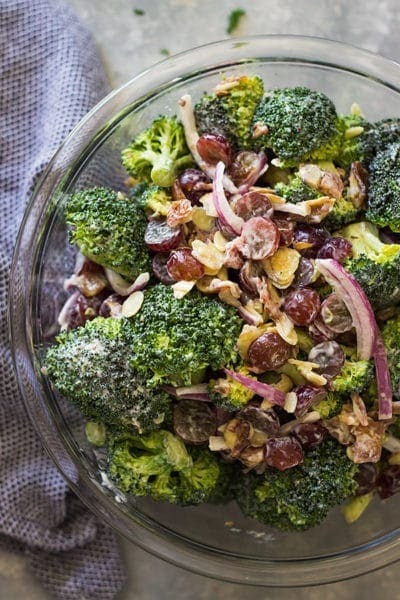 This salad can be changed up very easily. Add in your favorite rotisserie or grilled chicken, any type of short pasta works great or try cheese tortellini, change out the white beans for garbanzo beans, add in fresh mozzarella balls, add cucumber or spinach. Pretty much anything that goes well in a salad will work here. Malinda is the blogger, photographer and general mess maker in the kitchen. Along with her amazing husband and eight children they make up the complete team behind the blog Countryside Cravings. There you will find recipes that are simple, straight forward and won’t require any unusual ingredients. Her meals are aimed at pleasing the whole family! She loves reading cookbooks, trying new recipes, spending time with family and friends and enjoying the great outdoors. Some of her guilty pleasures are enjoying a bowl of ice cream smothered in hot fudge and caramel, peanut butter anything and a warm cookie fresh from the oven. When she’s not working on her blog Malinda leads a pretty normal life perfecting her playdoh skills, driving her kids to and from activities and snuggling with her husband on the couch in the evenings. 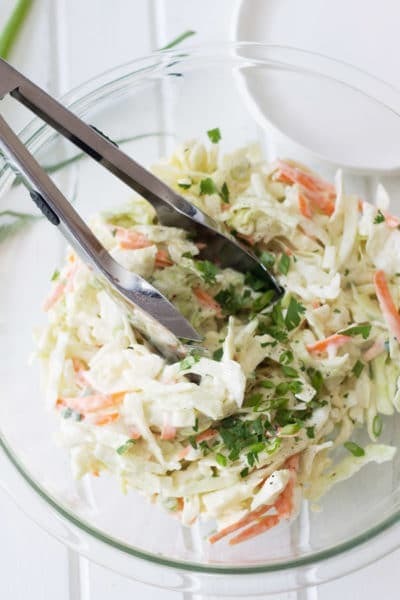 This is a great salad to take to a summer BBQ!! OH yeah. I saw this on Instagram and fell in love! This recipe is delicious. I was invited to a dinner party and the host made salmon. She asked me to bring a side dish and this ended up being the perfect pairing. I followed the recipe exactly as directed. I used small farfalle noodles and kalamata olives. Thank you! So glad you enjoyed it Melanie! Salmon sounds great with it!